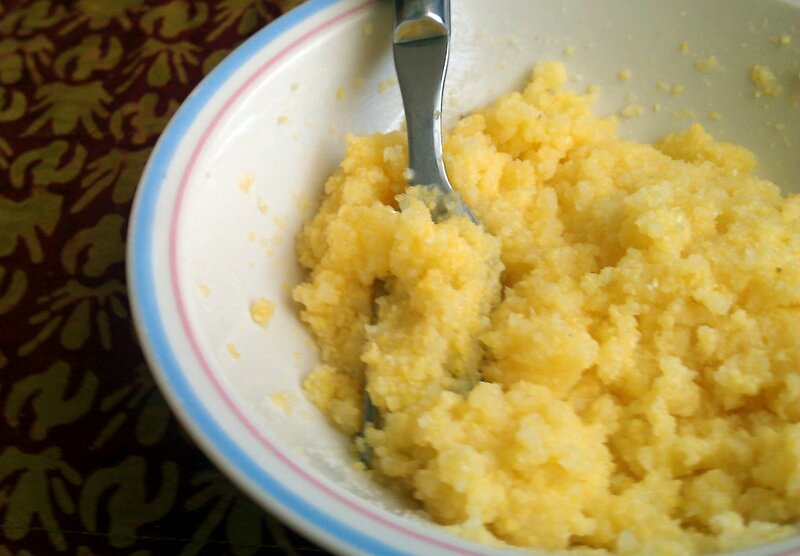 Today’s recipe post includes meat, but is really about the base grain ingredient here: polenta. Polenta is a misunderstood and often under-used ingredient, I think, because it requires a certain kind of attention to do it right. I’ll cover some of the basics and then get to the recipe at hand. Polenta is actually ground cornmeal — just like the stuff you buy to make cornbread, but ground to different consistencies. You can buy polenta either coarsely or finely ground. 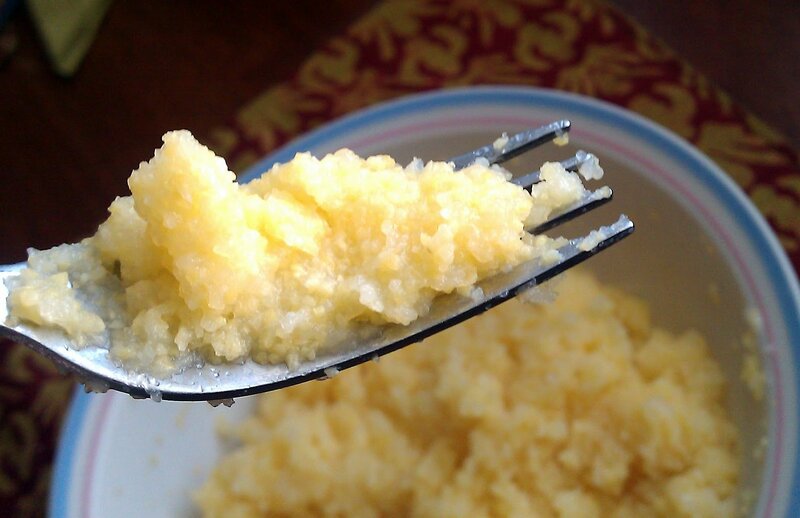 Coarse ground polenta is a grits-consistency, while fine-ground moves closer to cornmeal, and then to corn flour, with additional grinding. You can buy polenta in many different forms, too. If dry, you will have to boil the polenta to make it edible. But many stores now sell precooked polenta (usually in a tube) which has already been boiled, and then shaped. Baked polenta takes creamy polenta and transforms it into a solid by spreading it in a casserole dish (like the kind you’d bake brownie batter in) and either baking or chilling it to harden. From there, you can grill, fry, or slice the polenta into any shape you’d like. Some of my favorite solid polenta recipes include polenta sticks and polenta lasagne. But I’ve always had textural issues with creamy polenta, so lately I’ve been determined to try a recipe that would make it work for me. 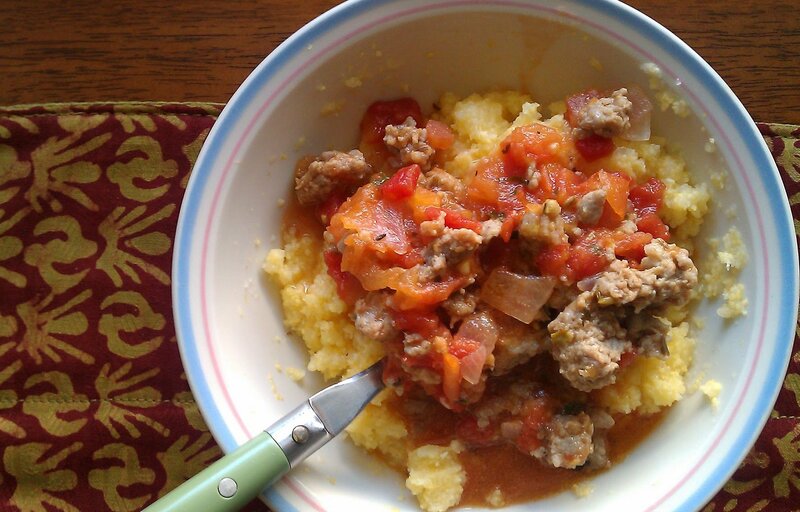 When I came across this one for parmesan polenta with spicy sausage, it sounded just right. I thought the chunky sauce would mix well with a flavorful creamy polenta and I wouldn’t mind the mush. And it worked! I definitely recommend mixing the parmesan into the polenta. It doesn’t have much flavor on its own. I used Italian-flavored pork sausage for the recipe, not the turkey sausage it calls for, but otherwise, stuck to the directions, figuring I could eat the leftovers for lunches this week. Hopefully this edition of Adventures encouraged you to try something new! What are your favorite polenta recipes? Leave a comment and share your tips! And as always, if you have any requests for ingredients to see showcased here, ask away! Such an underused food item. Growing up in an Italian family, I remember eating this all the time! It is a good alternative to pasta if that really is not your thing. My favorite is simply as a side dish with some tomato sauce and mozzerlla cheese (preferably melted) on top. It makes you forget all about spaghetti and meatballs!